I am in the process of setting up another website at this time. I have been extaordinary busy these last few months and the little free time that I have had I have spent painting for my clients. Right now I am unable to accept any additional commission work, but if you are interested still get in touch and I can update you further. I like to find your blog. In this blog you shared numbers of beautiful paintings with all of us. I hope that you will presenting some more information on coming days. Nice stuff! This is an affordable, US based painting service. 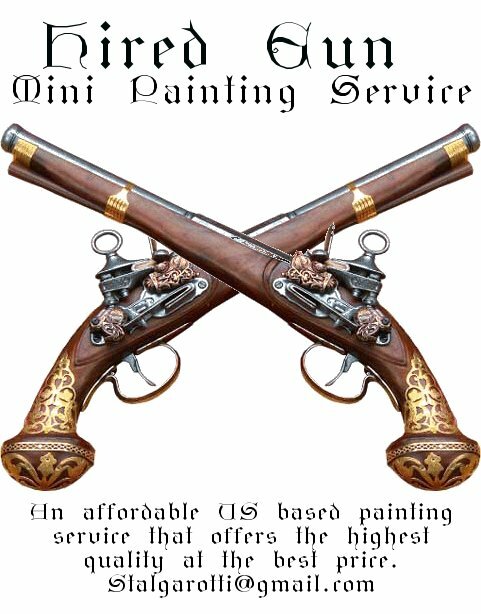 I specialize in full army painting and high detail centerpiece figures. Please feel free to e-mail me with any questions regaring work you might want done. And I guarantee all work done will be met with satisfaction. I love to paint and do it as much as possible. All images and names are copyrighted material by their owner(s). Infringement is not intended.